George Graham Reviews Elysian Fields' "Queen of the Meadow"
The alternative rock scene seems to have come full circle, from energetic, angst-filled music with grungy guitars, created as a protest against mellow, poetic rock, to music that has become laid-back and almost dreamy, with subtle, sometimes oblique lyrics. This week we have just such an album from a New York-based group called Elysian Fields. It's their third CD to be released, called Queen of the Meadow. Elysian Fields was formed in 1995 as a duo by vocalist and lyricist Jennifer Charles and guitarist Oren Bloedow. Ms. Charles is described as the daughter of a torch singer who grew up in Washington, DC, and was living on her own by her high school days, performing underage at various clubs with not the best of reputations. She was involved with the punk scene in Washington, then moved to New York to attend college and began writing and performing poetry and picking up jobs as an actress and model along the way. Oren Bloedow is a distinctive and creative guitarist with a fair amount of jazz influence, whose own eponymous solo album we featured in this review series in the early 1990s. Bloedow had been involved with various creative New York-based bands of the period, and also played bass in the John Lurie's Lounge Lizards for a while. When Ms. Charles and Bloedow first started performing together, they quickly attracted a good deal of attention on New York's post-alternative scene which also included artists like the late Jeff Buckley. Elysian Fields brought together Ms. Charles' dark, oblique poetry and breathy vocals with Bloedow's harmonically interesting guitar work. They were soon signed by a subsidiary of one of the major record labels, and released a CD called Bleed Your Cedar, which attracted favorable reviews, and found an audience in France, where such vaguely romantic yet world-weary music has a long tradition. They attempted to follow that with another CD, but their label felt that their music was not commercial enough and ordered that it be re-mixed with another producer. The group refused, and after a contractual dispute with their record company was finally resolved, they are off on their own, recording for an independent label. In the meantime, the group contributed to some anthologies and other projects for films. Now they are out with Queen of the Meadow, and it's a fascinating record. It again brings together Bloedow's jazz influences, with some hints of old German cabaret, with Ms. Charles' high, breathy, Marilyn Monroe voice. The jazz influence is further underscored by the presence of two regular legit jazz players for the rhythm section, bassist James Genus and drummer Ben Perowsky, who have played on dozens of CDs by veteran jazz artists. Rounding out the regular personnel on the CD is keyboard man James Saft, who plays everything from piano to old fashioned electric organs to accordions. While the instrumentation is often acoustic, the overall sound takes on a more electric quality, especially with the kind of sonic treatment given Ms. Charles' vocals. The result is very much a New York kind of sound, at once cosmopolitan and yet dark and brooding. While there is often a contemplative, mellow sound the music, there is always a dark, vaguely disquieting undercurrent, with the opaque, often inscrutable lyrics imparting a sometimes ominous quality, with one track being a musical setting of a poem by Edgar Allen Poe. 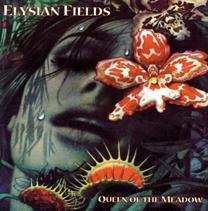 Queen of the Meadow by Elysian Fields is an intriguing album from a group which definitely has the trademarks of the New York alternative scene. Oren Bloedow and Jennifer Charles create music that is at once beguiling with its come-hither quality, and unsettling with its often odd, inscrutable lyrics that leave one with dark, ominous impressions. Ms. Charles' vocals are also a study in contrasts, with an outwardly romantic whispery delivery, but a kind of rawness born of her upbringing on the punk scene. Musically, the group features first-rate musicianship with jazz and cabaret influence surfacing frequently, but enough ingredients from the alternative rock scene to give the album a bit of an edge, and remove Elysian Fields from contention as just a swing- or cabaret-revival band. From a sonic standpoint, the CD gets about an A-minus from us. The dynamic range is better than most current CDs, but the recording lacks a bit of clarity, and the electronic effects on Ms. Charles vocals can get a little overbearing, especially given her own distinctive style. Queen of the Meadow is definitely not a party album, with its largely dark, ruminating undercurrents, but it has an idiosyncratic charm. It's the kind of multi-faceted record that can be approached either as appealing, if slightly quirky background listening, or as the kind of record that one can spend hours with trying to decipher and in the process, discovering something new each time you listen.